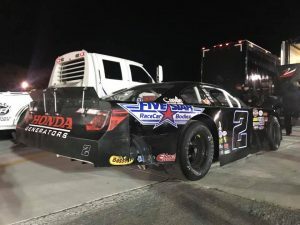 Hampton, VA, April 4, 2018 (Newswire.com) – 17-year-old NASCAR Drive For Diversity Racer and California native Ryan Vargas made his East Coast NASCAR Whelen All-American Series Debut at Larry King Law’s Langley Speedway in Hampton, Virginia on Saturday. He was fast in both 75-lap main events, earning a best finish of third in race two with his Rev Racing Five Star Bodies Toyota after an 11th place finish in race one. Vargas noted the cold temperatures (in the 40’s during the day) and lack of grip in the track surface caused a number of racers to have difficulties with setup, especially in practice and qualifying. In race two, Vargas had to do some nifty driving to avoid a crash on lap two, and then contact with another car caused a second crash behind him that slowed the field again before ten laps had gone up on the scoreboard. Once the field got rolling, he was able to take advantage of some longer green flag runs and methodically pass his way forward to finish third. Some of NASCAR’s most storied legends have competed at Langley Speedway over the years, including seven-time Monster Energy NASCAR Cup Series champions Richard Petty and Jimmie Johnson, Chase Elliott, and former Langley Speedway track champion Denny Hamlin, whose Denny Hamlin Showdown NASCAR Late Model event is coming up on Thursday, April 19 at Langley. The next race for Vargas at Langley is this Saturday night, April 7th. Qualifying will take place at 4:30 p.m. and race time scheduled for 7 p.m. ET. Langley Speedway is a .397-mile oval that is beginning its 67th year of racing action. Fans who cannot make it to the track on Saturday can watch all the racing action at no charge on FansChoice.TV.